Some random thoughts about Steve Draun: We met in 1970 and have been friends ever since. 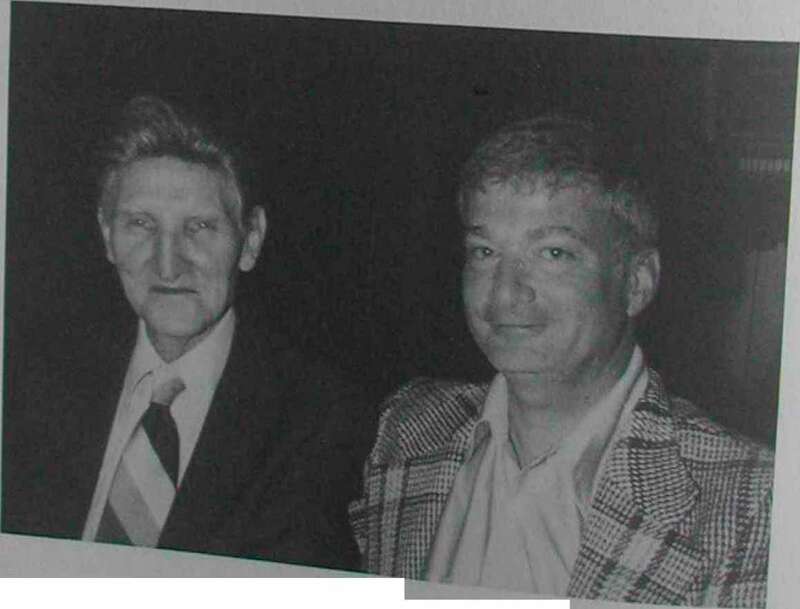 He introduced me to Edward Mario and, with his influence, stimulated a magic dialogue that we've had for twenty years. He is the only person I know that learned most of his early magic from books without seeing someone else perform it. He even learned the Faro Shuffle this way. Steve is well-read in magic and is an ardent student. He has a good eye for effects from just reading. He handles cards, coins, balls, and linking rings flawlessly. He knows his angles expertly and fools everyone. He is very opinionated regarding magic theory and challenged Mario about credits in an adversarial relation. Incredibly, he got away with it while always being Mario s friend. He has been my technical mentor. As an aside, we have made wagers on the most incredible things. One that comes to mind is that Steve bet me that Evel Kinevel would die in the Snake Canyon. Needless to say, I went on a ten-year winning spree that was fabulous—most of the time he picked the favorites. Lately we are still betting, but the pendulum is swinging in his direction. He is fun to be around, session with, and watch do magic. I strongly suggest that you learn his techniques and apply them to your magic, or learn his effects, because with them I guarantee that you will fool everyone. S^^tS:" aTptent SK^tS. he has contributed to books Sd magaSes^ He has been a great fnend and real influence m my magic. Simon Aronson: Who or what inspires this magician is beyond me Although a member of our group from the beginning, he has taken a different path. His magic leaves no clue with which to uncover its diabolical secret. If you are addicted tc getting fooled, and you're ever in Chicago, look up Simon. Saturday session. I thought he was just another kid playing magician. How was I to know that his wild talent and determination would make him one of the best entertainers in the business. full^e^fession^ tn th^lT^fFS °f the sessi°n, Joel was the first to turn up restaurant magic the tableTL?^ 1 Was Joel s mentor, but now that I've taken experience in this field has been a Zl Ume<1 Joel's willingness to share his vast great asset to me. ®y proh1«« He was very generous with h.s knowledge, clarifying his own writing for any and all who asked. A good deal of the material in this book was inspired by Ed's work. Not too many people have heard of Steve Draun although he is quite well known among those in the inner circle of magic. Those who have had the good fortune to see him perform have witnessed some excellent magic as compared to the obvious finger flinging of so-called experts. This does not mean that Steve does not do sleights, but rather that the sleights are subdued, thus making a sleight-of-hand effect appear sleightless. Steve is very discriminating in his choice of methods and effects. All the effects are direct and their plots are easily understood by laymen or magicians, but their methodology is skillfully concealed from even the most knowledgeable expert. reminded him that his book The Action Palm contained no credits at all. He replied that his book didn't need credits. I recall from my youth a quotation from Samuel (Dictionary) Johnson: "A man of genius has seldom been ruined but by himself." Ed was a controversial magician, but after time has sifted and distilled his massive contribution, I believe he will be remembered as the most significant influence in card magic in the twentieth century. At this point I'd like to explain a little about my approach to card magic and the guide lines used to create the material in this book. First of all, in my opinion, if you are still using old techniques like those found in classic books such as Expert Card Technique or The Expert at the Card Table, you are using inferior handlings. Please do not misunderstand, I am not disparaging these old books, and many of the methods and effects are great and I have learned much from them, but we have not all been sitting on our hands for the last fifty or hundred years. The sleights have been improved. So if it's the best technology you're after, read the most advanced, modern literature. 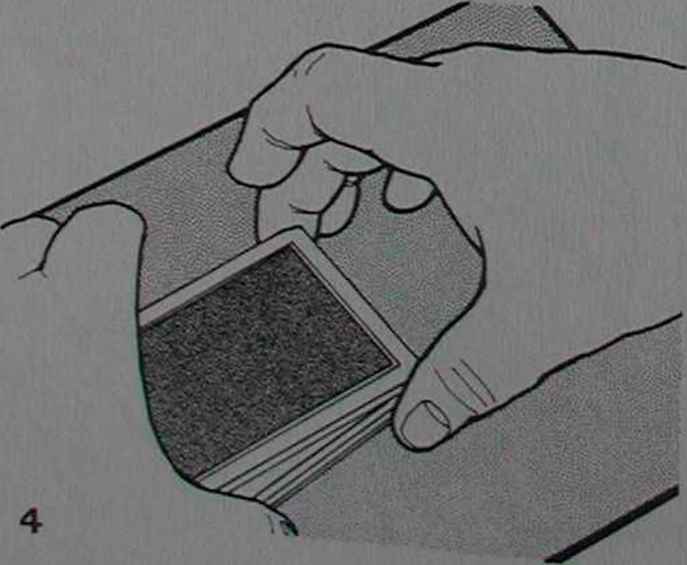 There are many moves in card magic that require both hands to be on the deck at the same time. The usual excuse for this is to square the pack. The trouble is that the pack is probably already square. The moves I refer to are: palms, passes, glimpses, reverses, get-readies, etc. This excessive squaring is not at all surprising when you consider the standard text most of us learned from. For example, I have before me a copy of Expert Card Technique. It has four chapters on palming, with a total of twenty-six methods. Eighteen of these methods suggest squaring as the cover! It is not my intention, at this point, to offer substitutions, but the book you are reading has many two-handed moves, none of which use a squaring action on a squared deck. In my opinion, if you would start now to expunge from your technology the action of squaring a squared deck your card handling will become more efficient and deceptive. Finally, when it comes to palming, it is a personal quirk of mine not to hold out mean by this that I prefer to move directly from one packet to the other or from tl deck to the pocket or wallet, card box, etc., rather than keeping cards in the n-,/' even for a few seconds. 1 am not suggesting this is the only way, but that it's mv I have seen some fine magicians hold out with great success, but I think vou'H f^ that the procedures in this book will deceive anyone. lecture notes instead of the finer presentation afforded by a real book. As I write these last few lines I look around the room and see a lifetime collection of hundreds of magic books and realize that I don't know hundreds of tricks Obviously some of these works did not have much meaning for me. I can only hope that somewhere in these pages you'll find something of lasting value. 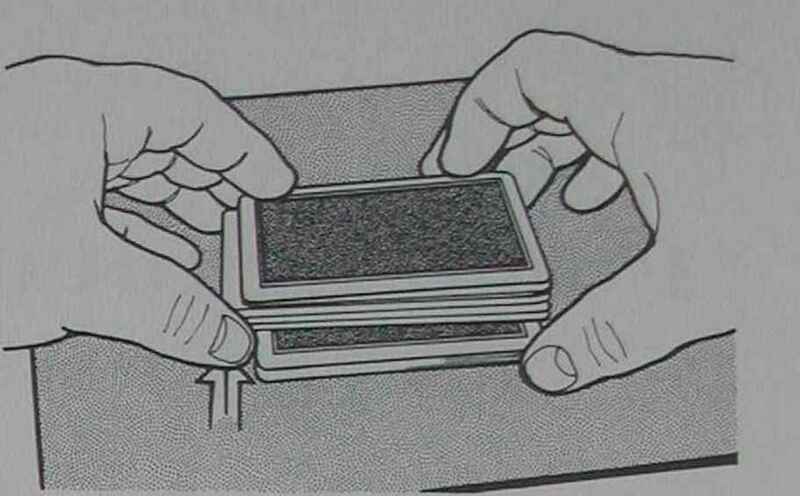 The idea of doing what appears to be a genuine Two-Card Pushoff Double Lift has teased cardmen for many years. There are some fanciful methods in print such as the one in Expert Card Technique, and then there is the more practical well-known simulation devised by Vernon. There are ways, of course, to completely sidestep pushing over two cards prior to lifting them off the deck, such as Daley's Hit Double Lift, where the cards are lifted at the right long side and dragged over. Mario's attempt to turn that into a simulation of a Two-Card Pushoff by adding a fake left thumb push is a nice touch. Still, really being able to push over two cards rather neatly on demand would be nicer—Steve Draun does it about eighty percent of the time. The following method is designed to cover the "out" on the other twenty percent. It is similar in concept to a technique of Brother John Hamman's, and both are said to have been preceded by Tenkai. side of the thutnhtip is lowered on» <*>< The flesh must hang partially over the cdg"
the top cards—hopefully, with quite a bit of practice, the top two (fig.2 is an exposed view from the outer end). With a gentle downward pressure, the left thumb pushes over the top two or three cards. This is done purely by feel, something that sounds outlandish until after you've practiced for several months and develop the needed sensitivity. For now, try to push over at least two: you will probably get three cards most of the time. 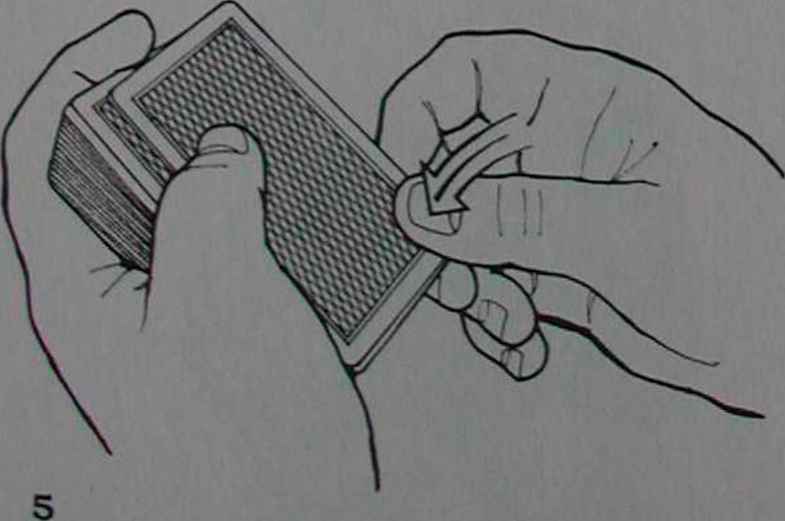 The inner left corner of the moving cards pivots against the base of the left thumb (fig.3). Note that the alignment of the moving cards need not be perfect—that will be corrected if necessary in a moment. 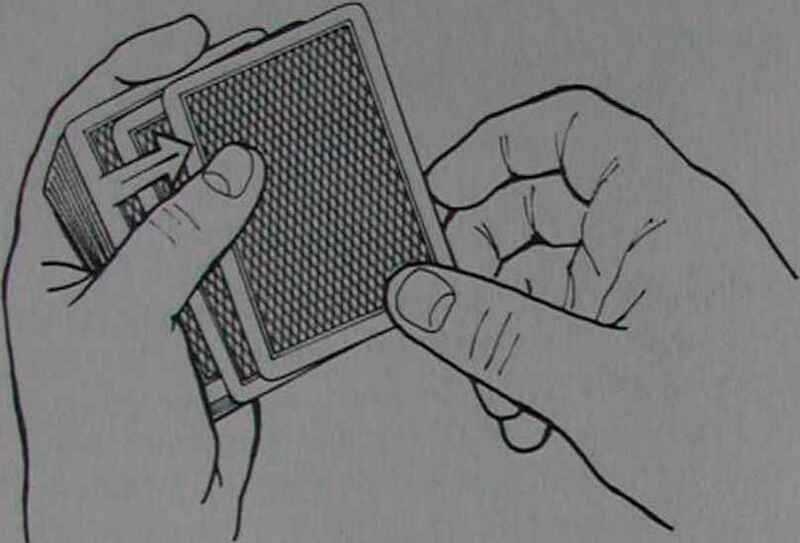 Raise the left second and third fingers to beneath the exposed portion of the face of the pushed-over cards. At the same time, your palm-down right hand descends over the deck, lightly grasping the outer right corner of the moving block. 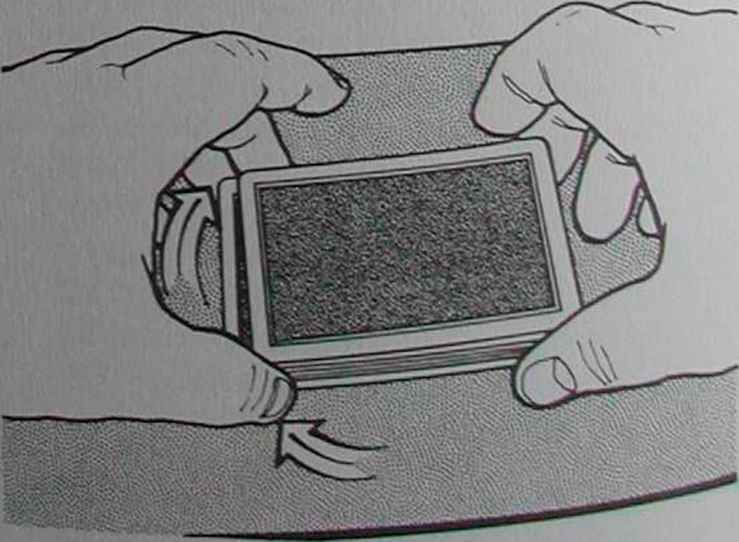 That block is cradled between the second fingertip and thumbtip, with the first finger merely resting on top of the corner (fig.4). 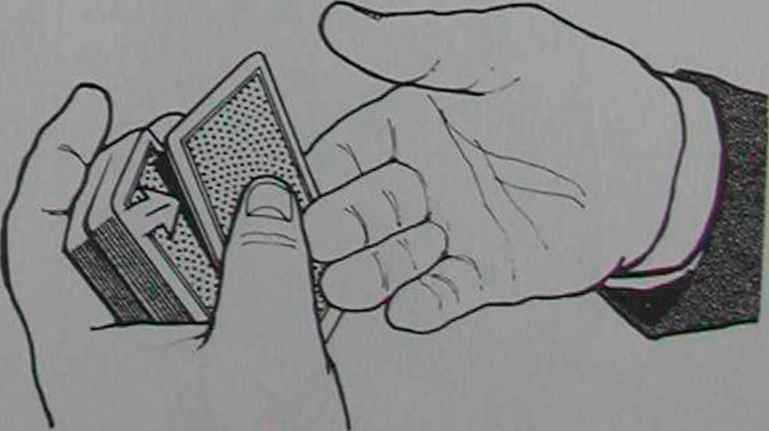 A slight squeeze with the thumb and second finger returns the cards to perfect alignment. ihiY?c^d as d^cribed in^ the preceding paragraph, your left thumb pulls it squarj with the deck as the double card is snapped face up. The opposite approach to the Double Lift is to abandon all attempts to recreate the natural and attempt some more flourishy handling which relies on the thought "that couldn't possibly be two cards.' Most handlings of the latter type are extremely difficult to master, but that is not the case with this technique. If careful attention is paid to the instructions, you should be able to do this almost immediately. 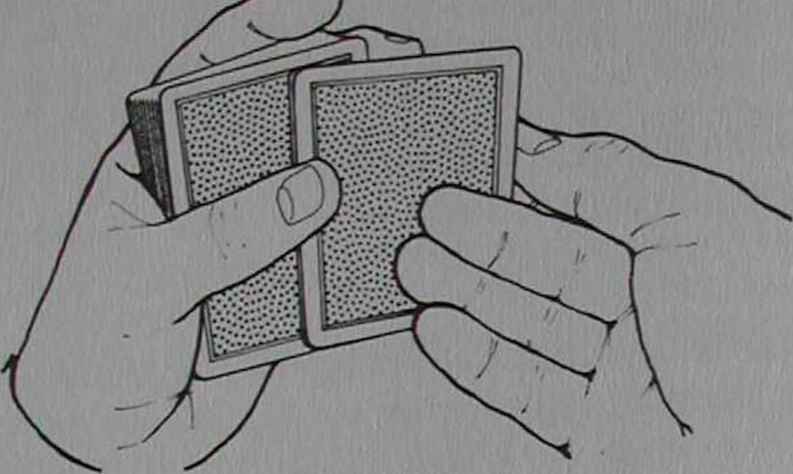 Begin by doing the Vernon Two-Card Pushoff, described in Midnight Ambitious Card" (Illustrations 6 and 7). The double card will now be rightjogged off the deck, and its right long side will remain slightly elevated by the upward pressure of the left third fingertip. 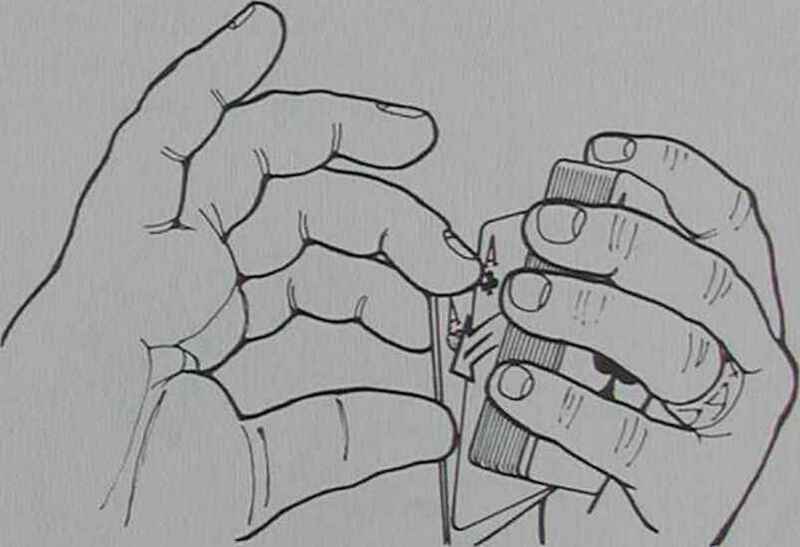 The left thumb rests lightly on the back of the pushed-over double card. Turn your right hand palm up and slip your right first fingertip under the double card, just inward of the left third finger. 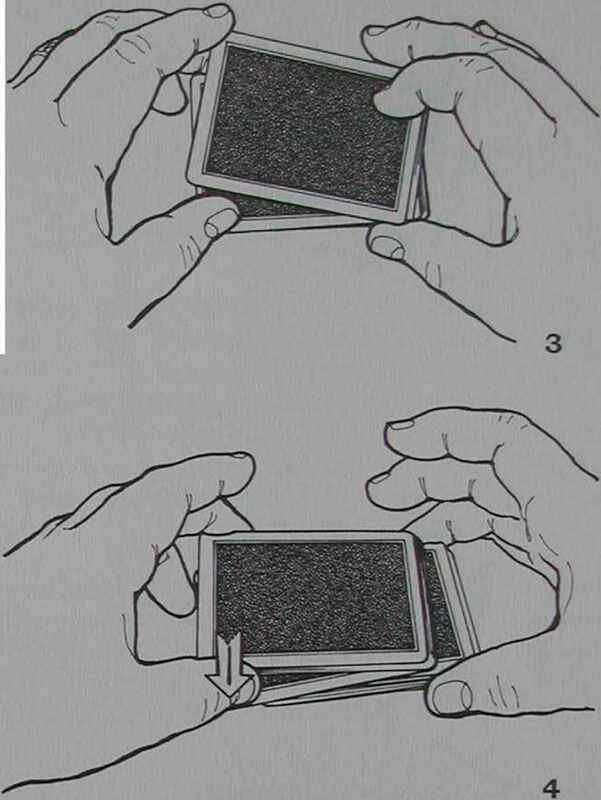 At the same time, lower your right second finger on top of the double card (fig. 1). The card is now clipped between these fingertips. card, even after it has begunl ascending, until your right thumb moves into position. The right hand pulls the double card to the right, clear of the deck. 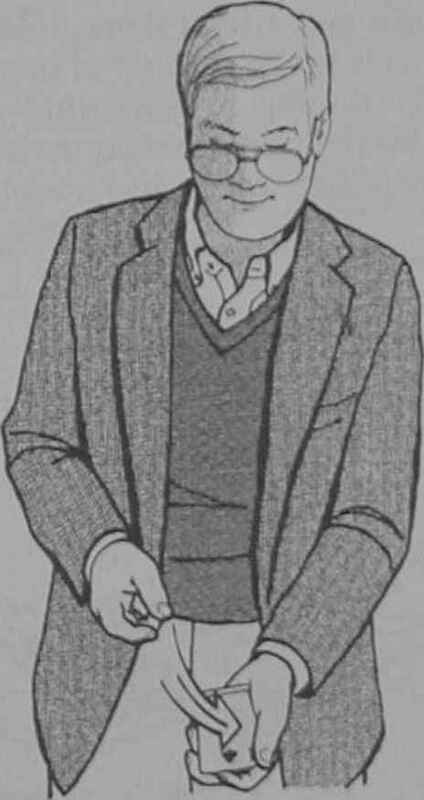 Your right hand turns palm toward you, rotating the double card completely face up (fig.4). At all times, the double card is gripped firmly between the fingers. It is the hand, not the card, that is turning. 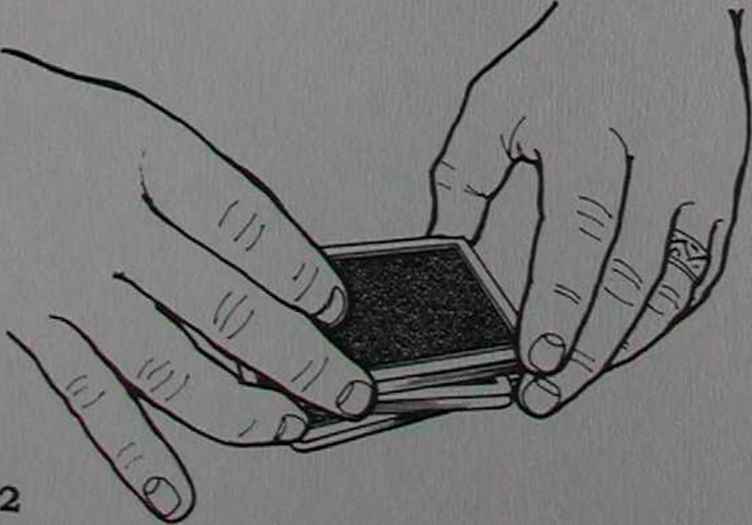 Lower your left thumb onto the left long side of the double card, pressing it in place partially on top of the deck. This frees your right hand and enables it to regrip at the center of the double card's right long side, thumb above and fingers beneath. 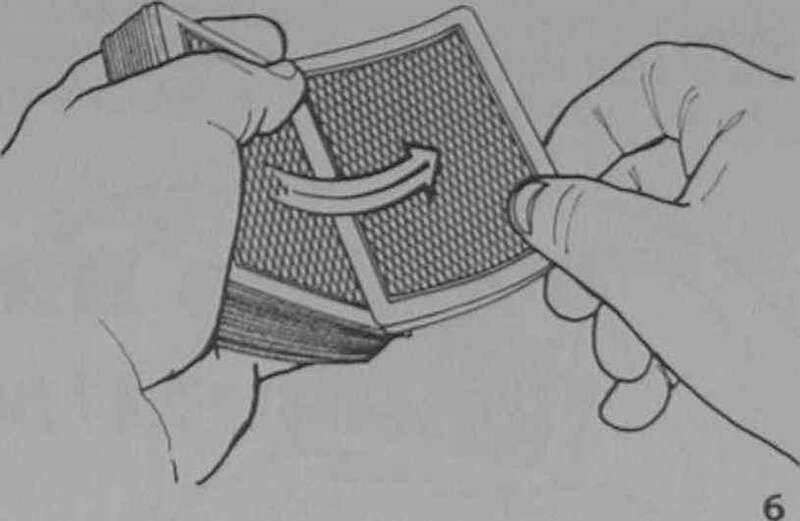 Buckle the double card so it snaps off the left thumb, then flip it face down on top of the deck. The secret of this lift, which has a beautiful smooth appearance, is to turn the double card face up in a seamless manner. A Double Turnover is an extraordinarily difficult thing to do well, as difficult in its own way as any Pass or Second Deal. Attaining the guilt-free light-as-air quality that a double card must have requires the mastery of difficult technique. It takes years of practice. Here is a handling which defies that idea-it achieves the required "light" look yet can be learned in a week or so. Here, it is timing, not dexterity, that must be mastered. 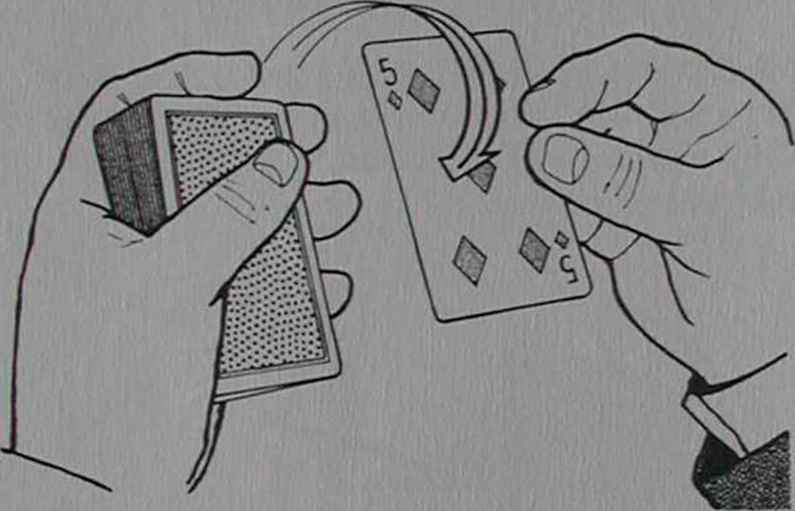 This sleight's parent is "The Natural Double Lift" (The Card Classics of Ken Krenzel, 1978), an interesting idea which eliminates the need to obtain a break before the lift, but unfortunately also requires you to obscure the entire deck from the audience with the back of your right hand during the turnover. This claustrophobic moment is eliminated in Steve's open handling of the sleight. The deck begins in face-down dealing position in your left hand. The vital aspect of this lift is the swing of the left hand toward the right hand, for it is during this movement that the secret activity occurs. The left hand is held away from the body, tilted forward slightly so the top of the deck is visible to the audience. The right hand is held a little higher, and about a foot diagonally inward and to the right of it—near the body. 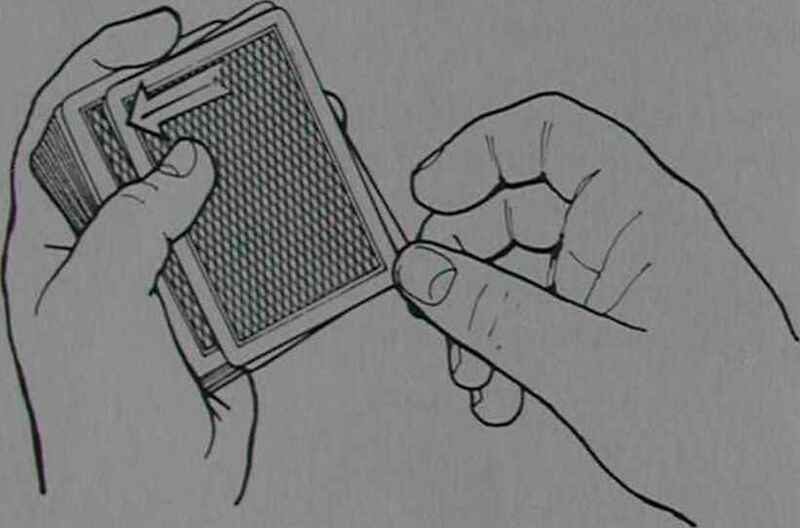 Your left thumb pushes over the top card about half an inch (fig. 1). fl^TZZ^ in illustration 2) the spectator's line of sight. the left (fig.4). You are not trying to align the cards, but simply preventing the audience from seeing, from beneath, that two cards have been pushed over. All of that occurs while the left hand is in motion. 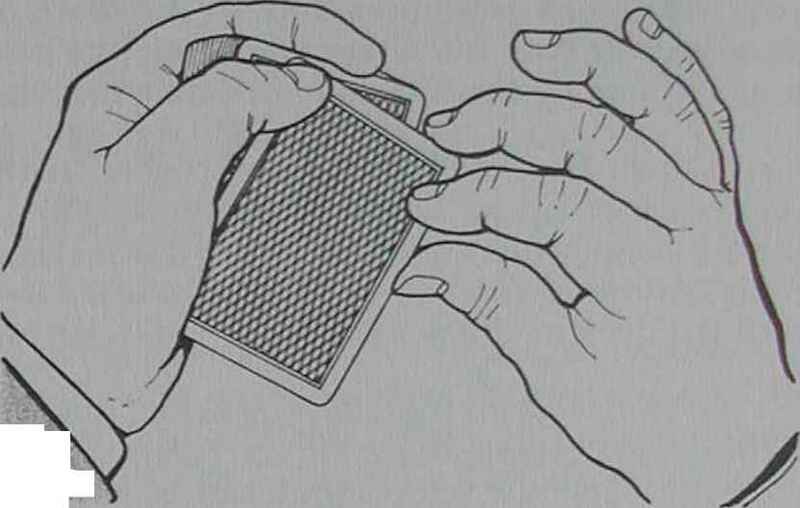 By the time it reaches your right hand, the cards should be in the position shown in illustration 4. 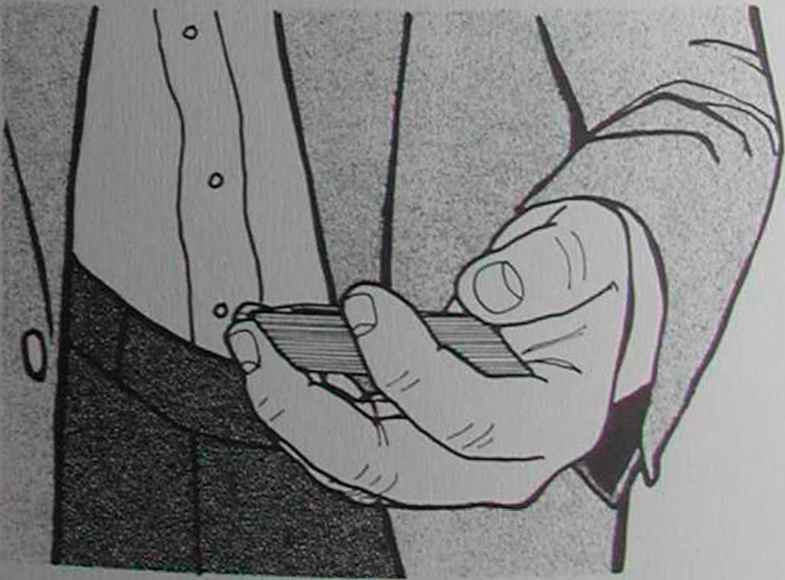 Your left hand guides the deck so that the right long side of the pushed-over second card lands on top of your right fingertips, then your thumb descends to complete the grip (fig. 5). 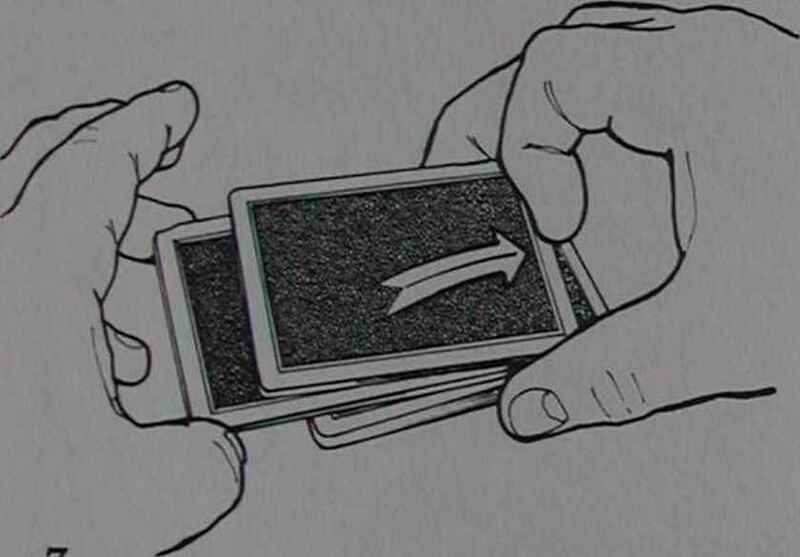 Your right hand immediately drags the double card to the right, until it's left long side meets the right long side of the deck (fig.6). 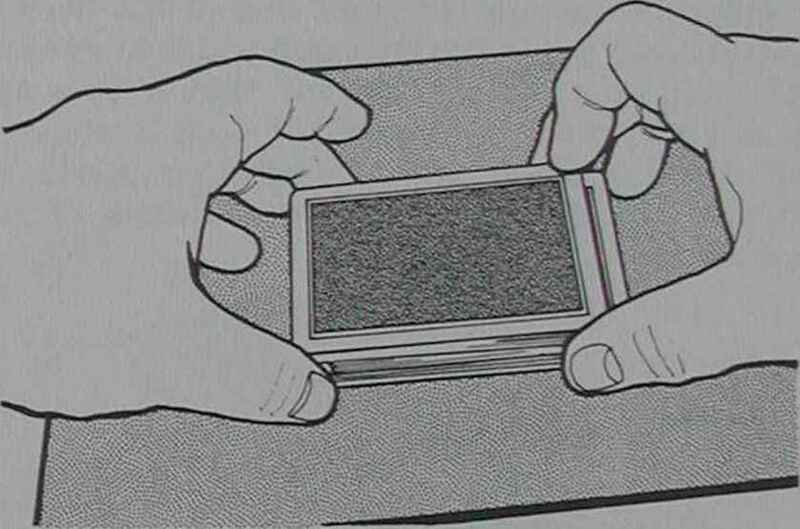 During this, the right thumb pulls the upper card fairly well into alignment with the lower card. 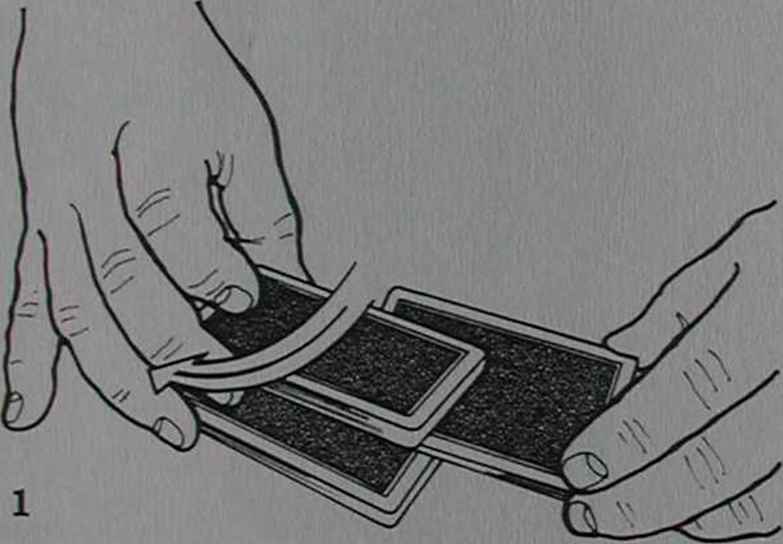 Now, flip the double card over onto the deck so it falls outjogged about a quarter of an inch, however, the instant it is released, your left hand swings back to its original position (fig.7). You do not wait for the double card to land on the deck before reversing the swing of the left hand. In order to obtain a break beneath the face-up double card, your left first finger moves to the outer end of tm* °utjogged cards and pulls hghtl-downward on them as they Pushed flush with the deck. 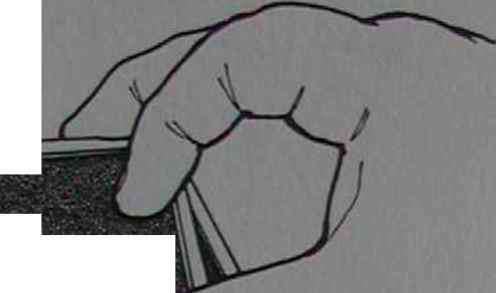 r 11* causes the inner end of the dout>'c card to rise as the card glides inward, enabling your left pinky to move beneath it. Steve turns the double card face down using the Vernon Two-Card Push Off described in "Midnight Ambitious Card." A bit of practice in front of the mirror will quickly teach you how high the right hand must be held, how far to swing the left hand forward and back, etc. The sleight is done smoothly and at a relaxed pace. There are only two of these, and each will control but a single card. Yet, they are I powerful tools in the arsenal of the table worker. Dr. Daley is rumored to have had a method for Double Undercutting cards with a tabled deck that used no breaks however he did not publish it before his sudden death in early 1954. These techniques which Steve has developed will increase efficiency and clean up any fiddling you may now be stuck doing for lack of a better technique. Begin with the face-down deck on the table in front of you in shuffle position. 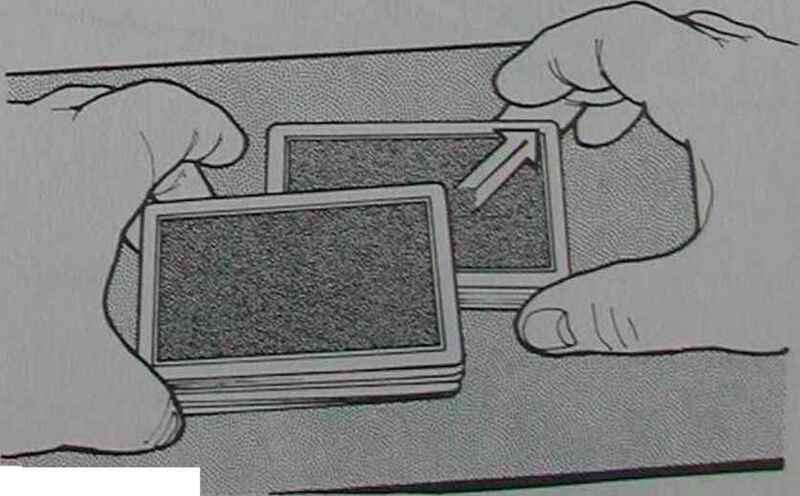 You will secretly transfer the top card to the bottom during Vernon's Cold Deck Cut which incorporates a new technique of Steve's for the transfer. Grasp the ends of the deck and, with the right second finger, lift the upper third. This enables your left thumb and second finger to grasp only the center third. While your left hand holds its center third in position, the right hand, holding the upper and lower thirds, moves out and to the right (fig.l). The right hand circles around aud lands on top of the center third, still held by the left hand. As the nght-hand cards touch down, the lower third (now in the middle), »s allowed to angle counter-clockwise slightly (fig.2). " You 11 find that your left thumb and first finger are in position to grasp both the top and center thirds (currently on top and bottom). This enables your right hand to now grasp only the lower third (now m the middle, angled). Pull out the third of the deck currently in the center and place it on top, angled as in figure 3. 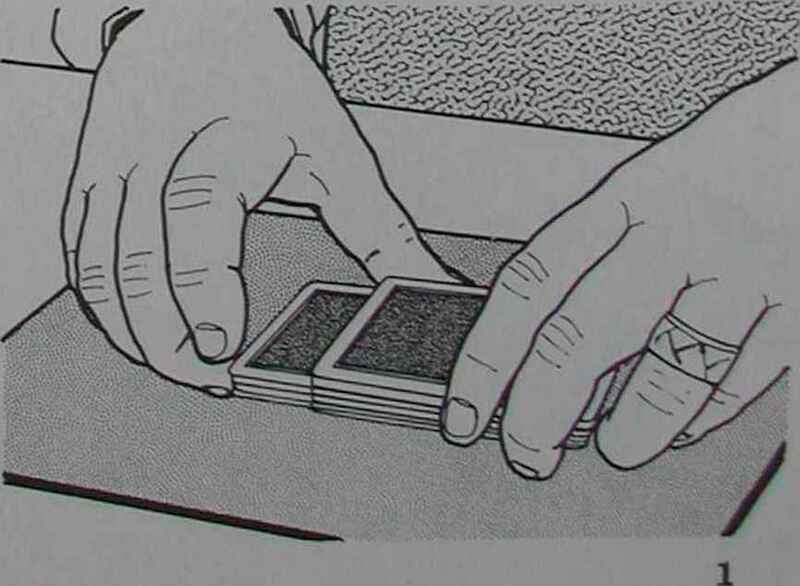 (The two thirds of the deck held by the left hand are allowed to fall together.) 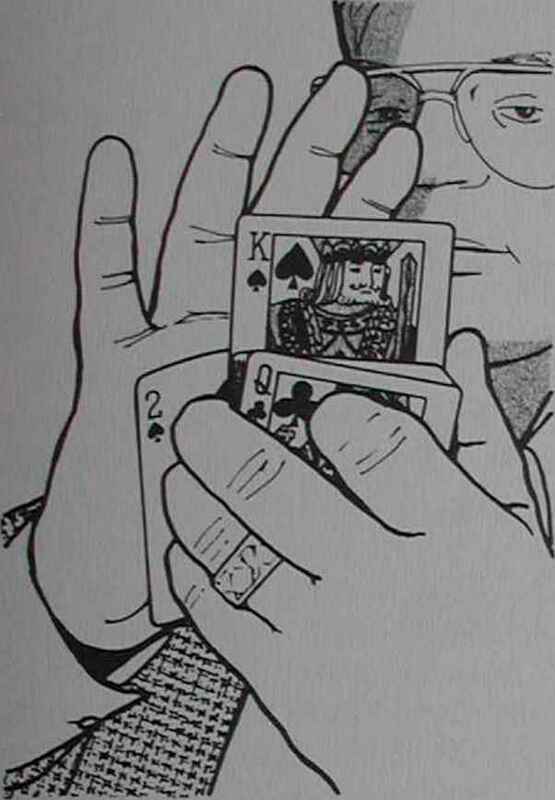 As the right hand places its cards on top, the left thumb moves onto the inner left corner of the top of the deck (currently in the center) as in figure 3. 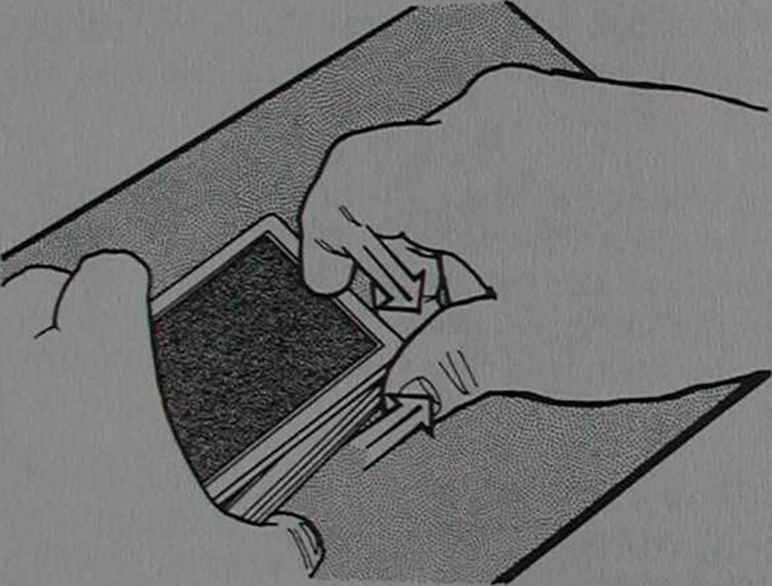 The left thumb presses lightly downward and shoves the card directly beneath it inward a fraction of an inch. 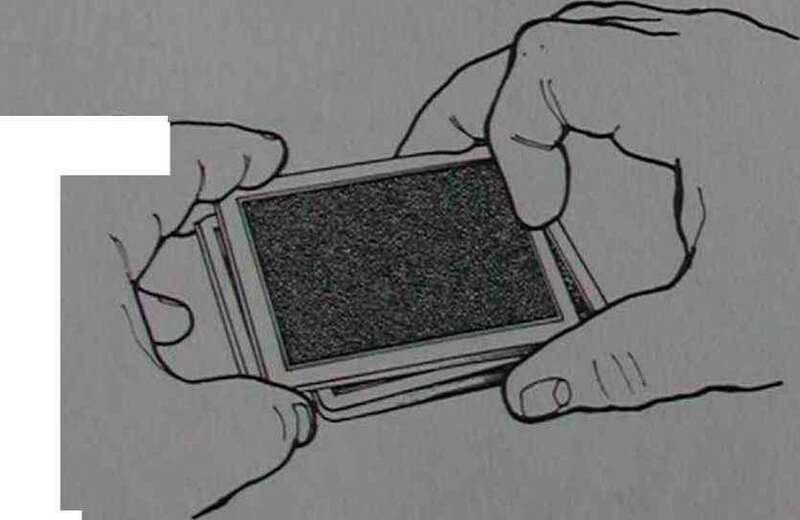 Continued downward pressure by the left thumb keeps that card in position as the right hand pulls out all the cards beneath it (fig.4 shows this just starting). The third of the deck currently on top, with the pushed-in card beneath it, will fall to the table, and the right hand places its two-thirds of the deck on top. Square the cards. The top card is now on bottom and the order of the entire deck is otherwise the same. As a teaching aid, turn the top card face up so it is easier to follow its progress through the cutting. The deck begins, as before, face down on the table in front of you in shuffle position. 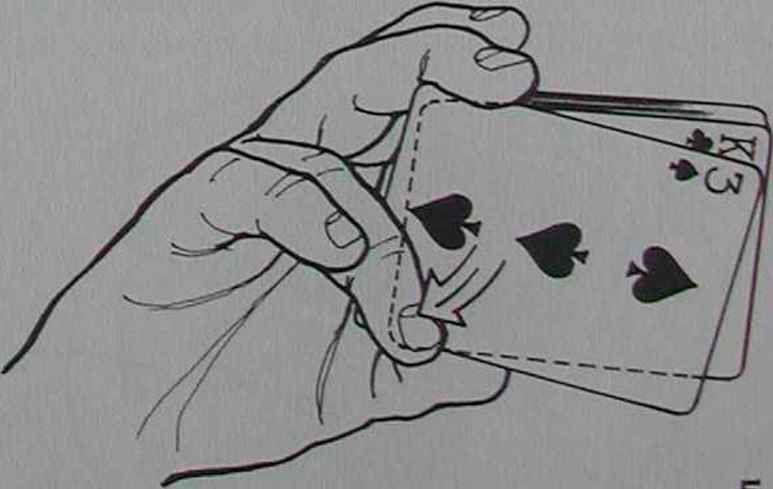 The bottom card will be secretly transferred to the top during what is commonly known as The Gambler's Cut, using a technique of Steve's akin to a Kelly Bottom Placement get-ready. 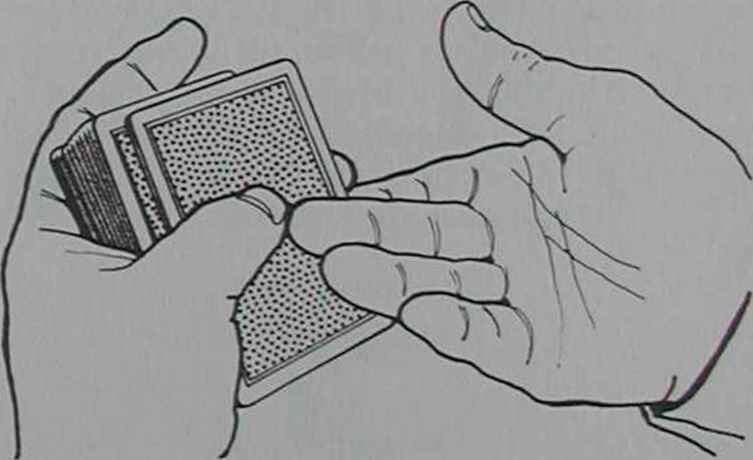 The moment the packets touch the left thumb and fingers shift their grip and hold only the original lower half (sans jogged bottom card) of the third of the deck which the right hand has just placed on top. This can be confusing: your right hand has just placed a third of the deck on top. Your left thumb and fingers grasp only the bottom half of that third (so the left hand holds a sixth of the deck). This enables the right hand to pull everything else, consisting of the lower two-thirds and the upper sixth of the deck, to the right (fig.7 shows this just starting). 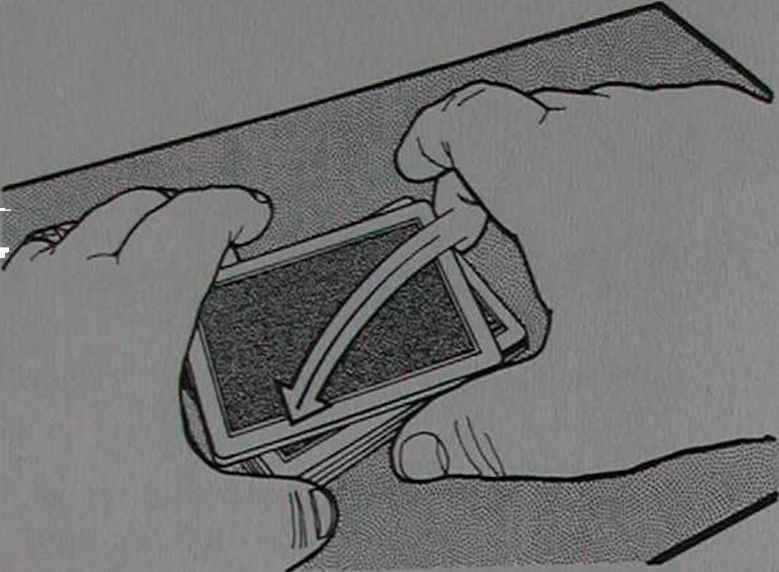 The right hand circles around and places its cards on top of those retained by the left hand so that the left-hand cards and the small packet jogged to the left on top of the deck line up (fig.8). The left thumb and fingers are now in position to hold both the upper and lower leftjogged packets, enabling the right hand to pull out the center two-thirds of the deck. The right hand circles around and drops its cards on top. Square the deck. The bottom card is now on top and the order of the entire deck is otherwise the same. 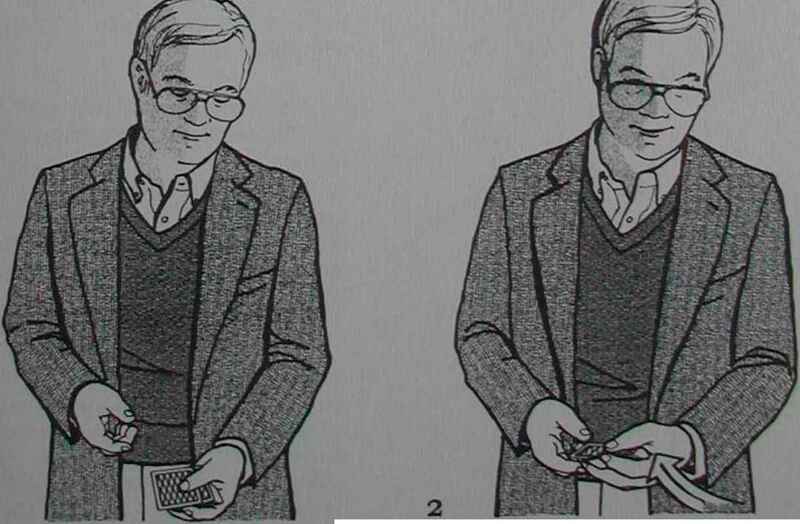 There have been a number of methods for doing Dai Vernon's Multiple Shift while the deck is on the table, and Ed Mario, in his booklet The Multiple Shift, credits Senator Crandall as the first to execute a shift in this manner (using the mechanics of Vernon's Triumph Shuffle). 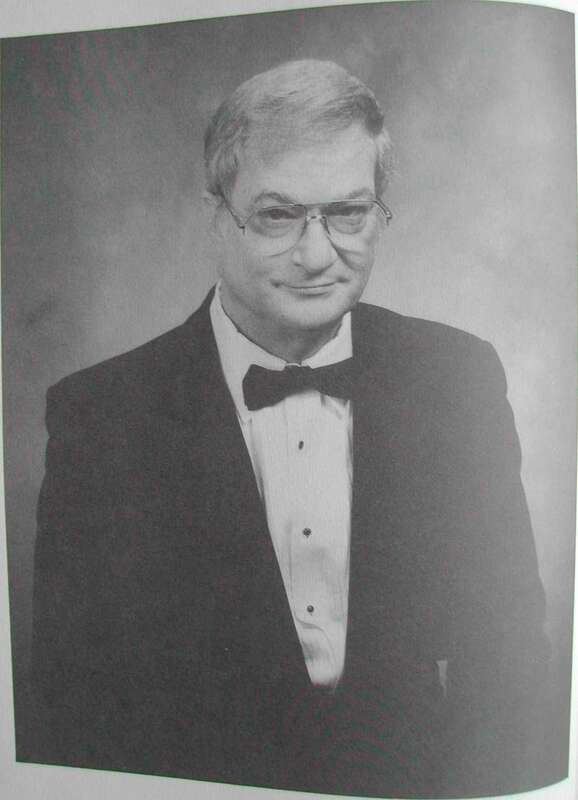 Subsequently, Jerry Andrus published another method in M.U.M. magazine, followed by Ed Mario's "Push-Through Shift" in the aforementioned booklet, and a method of Martin Nash's was explained by Stephen Minch in Ever So Slightly. Steve Draun's method, while being the most straightforward and easy to accomplish, is also one of the most deceptive. Remove the four Aces from the deck and place them aside. Table the deck directly in front of you, face down, in Riffle Shuffle position with one of the long sides toward you. Pick up one Ace and insert it, face down, into the right end of the deck about ten cards up from the bottom. Leave it rightjogged about an inch. Do exactly the same thing with the remaining three Aces, placing each one about ten cards above the other. 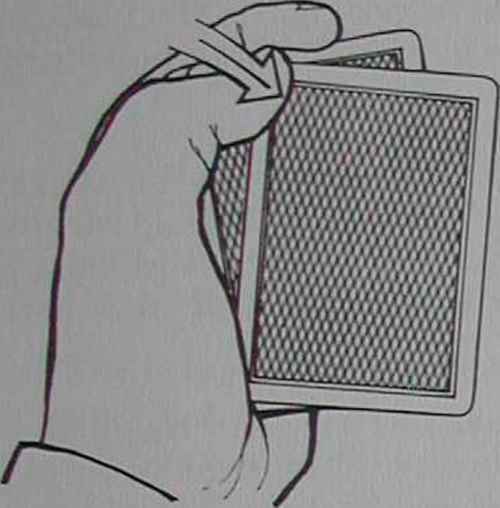 Position your hands over the deck as follows: your left grasps the left end of the deck between thumb, at the inner left corner, and second and third fingertips, which cradle the outer left corner; your right hand grasps the right end of the deck, thumb at inner right corner and second fingertip at the outer right corner of the rightjogged Aces (fig. 1). 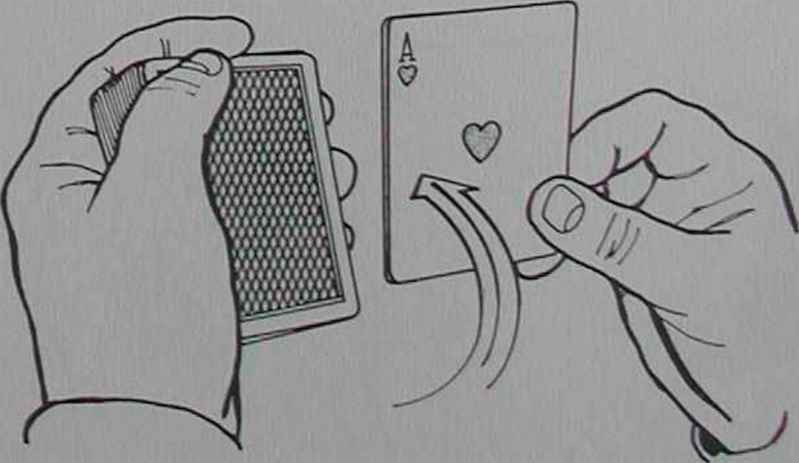 The Aces are pushed to the left, apparently into the deck—however, since your right second finger does all the pushing, the left ends of the Aces will turn inward as they move, and their inner left corners will end injogged (fig.2). Your right second fingertip should now be pressing directly against the outer right corner of the deck as shown. farther their outer left corners emerge from the left end of the deck, directly inward of your left third fingertip if it is properly positioned. The inner left corners of the Aces will also move out the inner left corner of the deck, and if your left thumb is pressing firmly against that corner it will prevent them from moving smoothly through. You will find that your left thumb and third finger are now automatically gripping the left ends of the Aces. the block of indifferent cards beneath the lowermost Ace must run the entire length of the deck, to the inner right corner. Your right thumb and second finger can now grasp the right end of this isolated lower block of cards. Cut this block out from beneath the deck and place it on top, leftjogged a quarter inch and in line with the Aces (fig. 7). The grip of the left thumb and third finger on the Aces is now extended to the block of cards just placed above them simply by squeezing a bit more. With a light touch by both hands, your right thumb and second finger can now grasp all the cards between the Aces and draw them diagonally to the right and outward (fig.8). Pull them out completely, allowing the Aces and indifferent cards to collapse to the table. Place the right-hand cards on top of the deck and square. The Aces are now on bottom. The final cut may be altered and extended slightly "Up The Ladder" style, resulting in a deck which is in exactly the same order as it was initially. After you have withdrawn all the cards from beneath the Aces, your right hand places them on top of the left-hand cards, but right-jogged a quarter inch. Without pausing, your right hand cuts the lower half of this rightjogged block out and to the right. It is placed back on top of the deck, but in line with the balance of the deck, farther to the left. This leaves a small block of cards rightjogged, and these are withdrawn by the right hand and placed on top. With this full-deck control/Multiple Shift, it is possible to do several routines where the Aces are lost and found, while retaining a full-deck stack.